Now that “UFC 118: Edgar vs. Penn 2″ is officially in the books, make sure to stream tonight’s post-fight press conference live right here on 5thRound.com at approximately 1:30AM ET/10:30PM PT. Saturday’s show took place inside the TD Garden in Boston, Massachusetts and featured a championship lightweight scrap between title holder Frankie Edgar and former champ BJ Penn. Opening for the highly anticipated mulligan was boxing legend James Toney’s mixed martial arts debut. 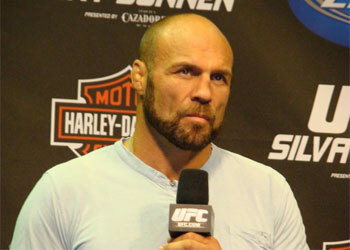 The 42-year-old took on UFC Hall of Famer Randy Couture in a heavyweight affair. In addition to UFC president Dana White and the card’s featured cast, the fighters that participated in the televised portion of the pay-per-view broadcast are also expected to attend the media pow-wow.